Thin is in. How thin of a laptop can you fit a GTX 980M? 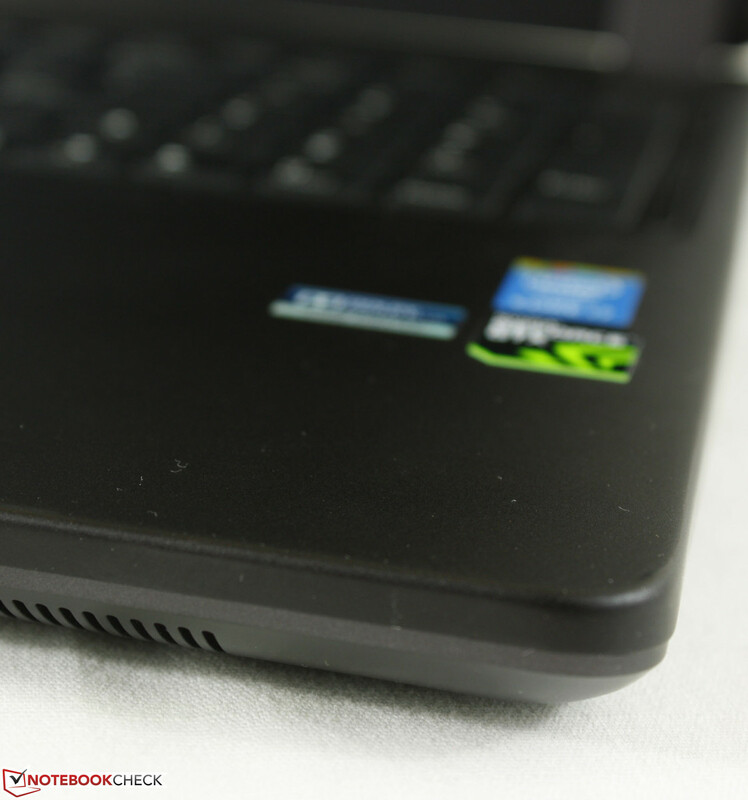 The Gigabyte P37 is the thinnest 17.3-inch notebook with the Nvidia GPU and we find out if there are any performance consequences that may entail. 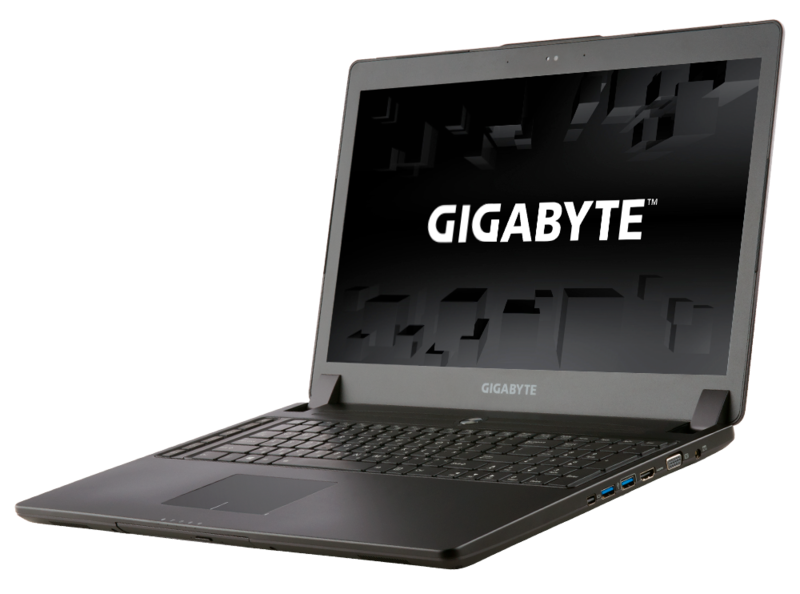 Gigabyte pride themselves in offering ultra slim and lightweight gaming models from the 14-inch P34W to the 15.6-inch P35 series and the even larger 17.3-inch P37 models. There are no compromises to the hardware either as these notebooks sport high-end GTX 970M and 980M GPUs with reasonably easy maintenance and accessibility. Today we take a closer look at the P37 series, in particular the P37X configuration. It's equipped with powerful mobile components including a Core i7-4720HQ, GTX 980M GPU, 16 GB RAM, matte 1080p IPS display, and 128 GB SSDs in RAID 0. 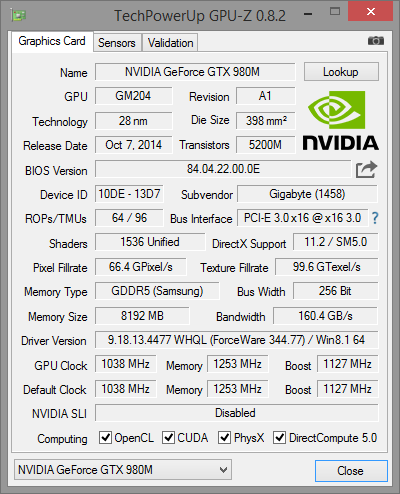 The only other configuration is the P37W, which is essentially identical save for its GTX 970M GPU and installed RAM. The P37X starts at $2000 with 8 GB RAM and a 1 TB HDD. 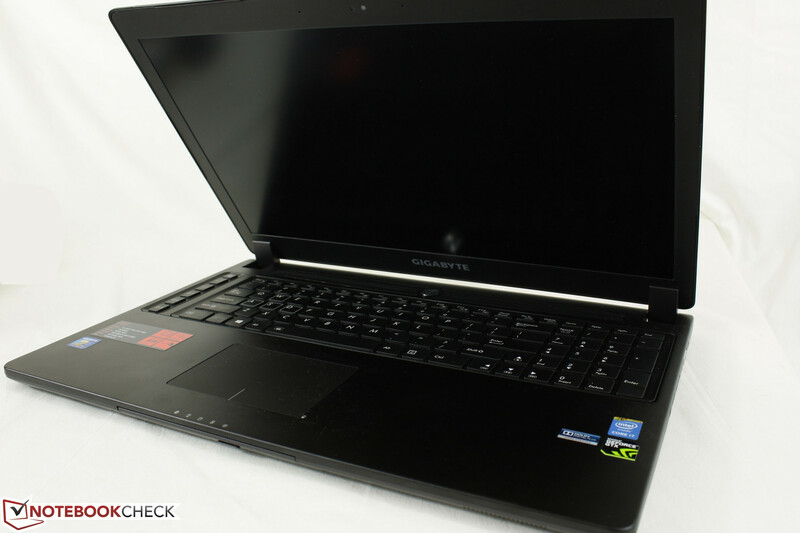 We compare it to the current popular lineup of 17-inch gaming notebooks to see if the Gigabyte can hold its own in terms of performance and expandability. If you're looking for the thinnest and lightest 17.3-inch notebook with GTX 980M graphics, then the P37X will certainly deliver. 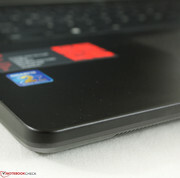 Its thickness of 22.5 mm is less than half of the popular Asus G751 and its weight of 2.8 to 2.9 kg is rivaled closest by the much less powerful Acer Aspire V17 Nitro at 3 kg. If anyone is counting, the MSI GS70 and its GTX 970M graphics is half a millimeter thinner and about 100 g lighter than the P37. 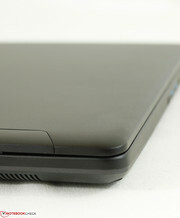 Otherwise, most gaming notebooks in this size category are usually in the 3.5 kg range or heavier. The slim profile on its own doesn't look very impressive at first glance, but the difference in size is remarkable when the Gigabyte is placed sitting next to the MSI GT72 or Alienware 17. Beyond the thin looks, the chassis has a very basic matte dark gray appearance with no special surfaces or accent marks to really make it stand out. It has a very barebones aesthetic as if the chassis was produced by Clevo. 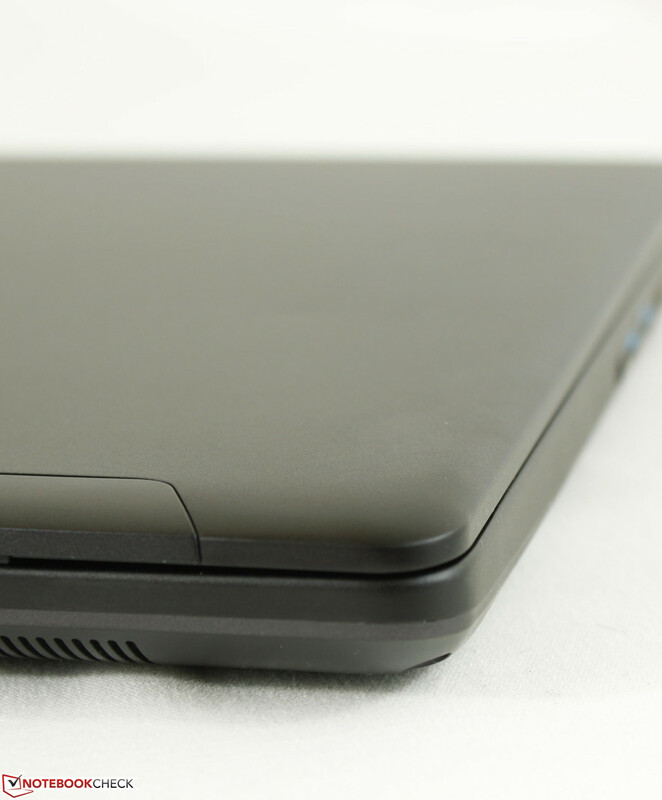 Visually, the aluminum lid and body look very similar to the smaller P34W. 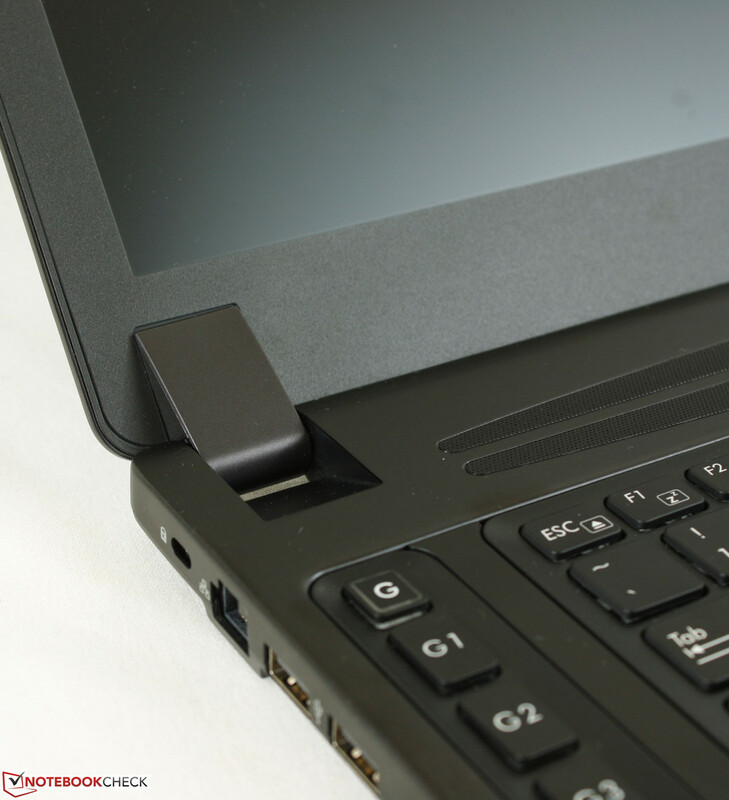 The base feels thick to prevent any major twisting or depressions, even down on the center of the keyboard, and the small hinges are taut up to the maximum angle allowed. The lid itself could have been more rigid as it can still be twisted side-to-side without too much effort. It's overall a strong case, especially compared to the lesser build qualities of the Lenovo Y70 and Acer V17 Nitro. Available interfaces are plentiful despite the thin profile of the notebook. Three video-out ports should be more than enough for users alongside the expected Gigabit Ethernet, 4x USB ports, and SD card reader. 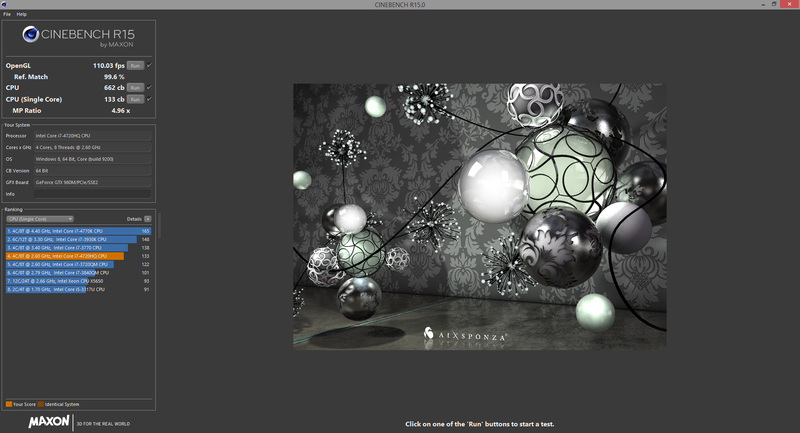 This is compared to only one video-out port on the Acer Aspire V17. For what it's worth, the Aorus X7 and GT72 have even more USB ports than the P37. A half-mini PCIe Intel 7260 card provides both 802.11ac and Bluetooth 4.0 support. This common dual-band module supports transfer speeds of up to 867 Mbps and we experienced no connectivity issues when paired with a standard home network. 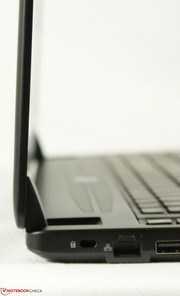 For the most reliable connection, a Gigabit Ethernet port is available as is standard for most gaming notebooks. This is certainly a sigh of relief especially after coming from the Razer Blade 14 and its very limited communication options. 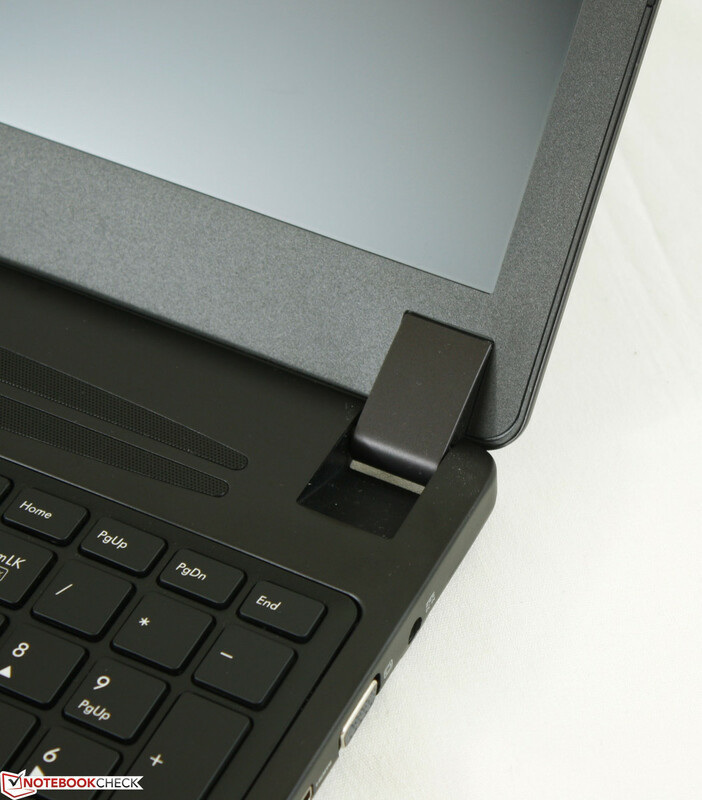 Additional options like WWAN or GPS are not available as expected from a dedicated gaming notebook. A full User's Guide, Gigabyte Drivers disc, PowerDVD 10 disc, and warranty card are included with the P37. An HDD bay caddy cover is thrown in as well since the optical drive can be removed to reduce weight or replaced with an additional 2.5-inch SATA drive. 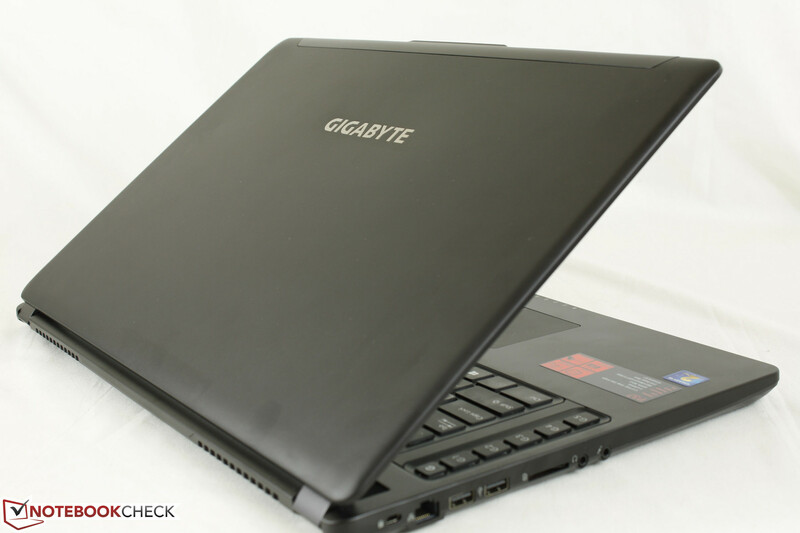 A two-year global warranty is standard for Gigabyte notebooks, which is a year more than most manufacturers. 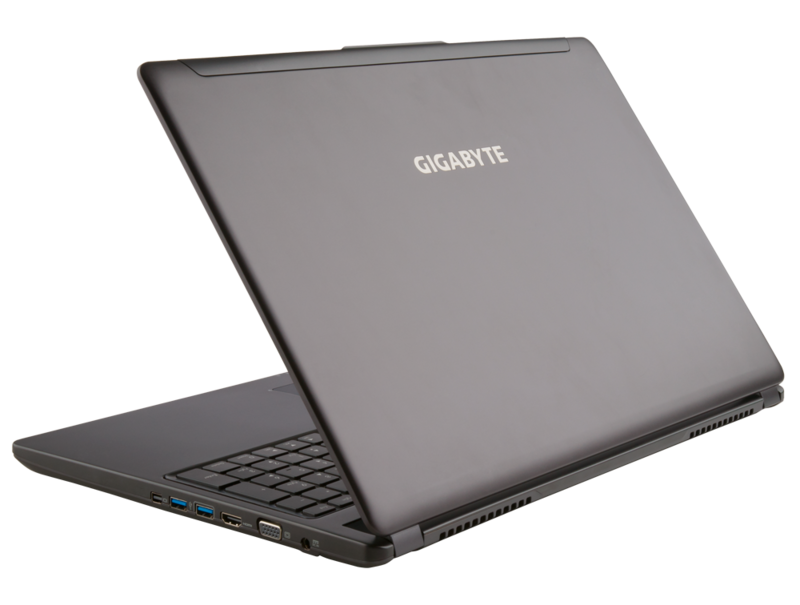 Buyers must register their purchases with Gigabyte here to receive the coverage. 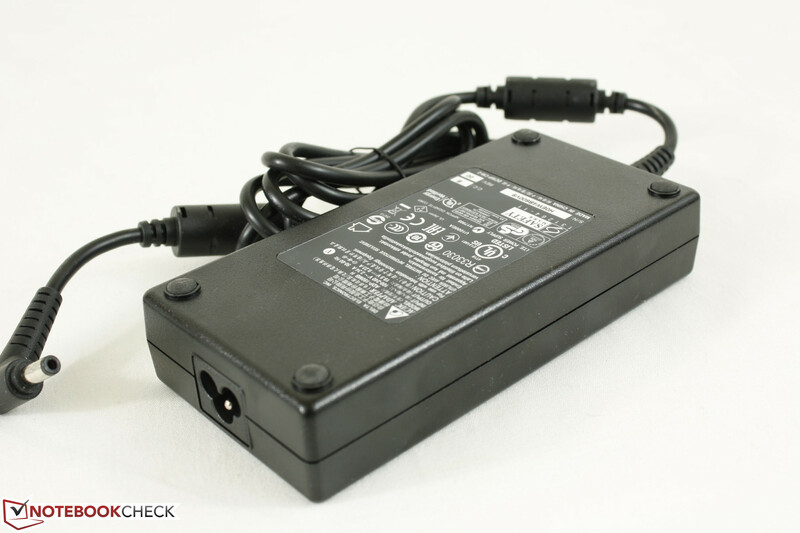 The AC adapter and battery are covered for one year only. 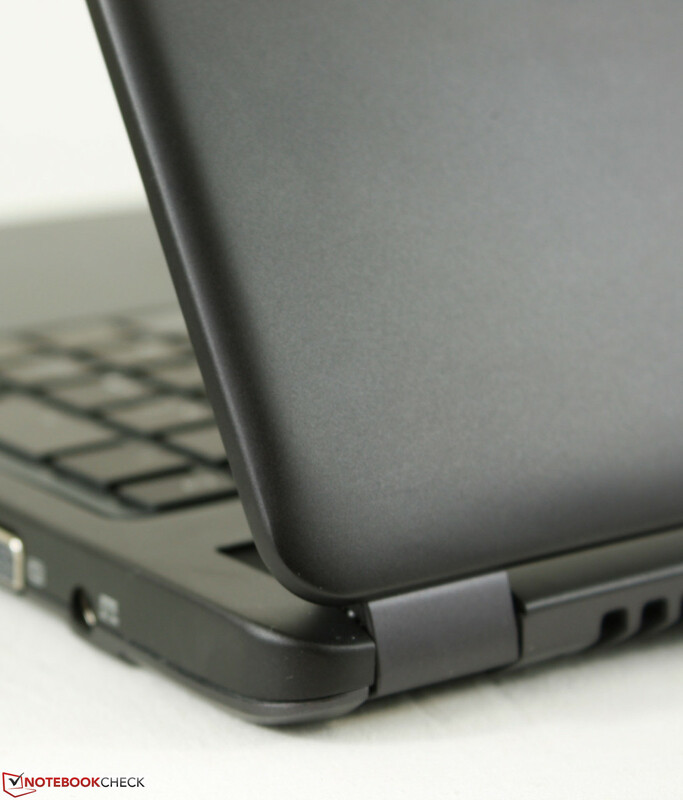 The full-size chicklet keyboard (35.5 x 10.5 cm) provides very good and relatively quiet tactile feedback with no responsiveness issues. Travel is satisfactory and a bit better than on the Y70, but could still be a bit deeper as it's a hair shallower than the keyboard on the Eurocom X8. There are no dedicated auxiliary keys as there are on the MSI G Series. A column of macro keys sits on the left hand side of the keyboard similar to the Alienware 18. 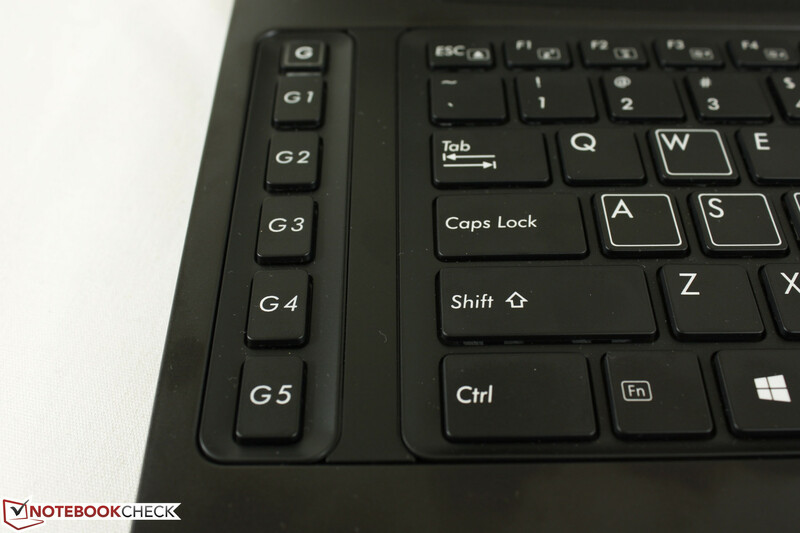 The five customizable keys (labeled G1 to G5) can be cycled through five different sets for a total of 25 different macros. 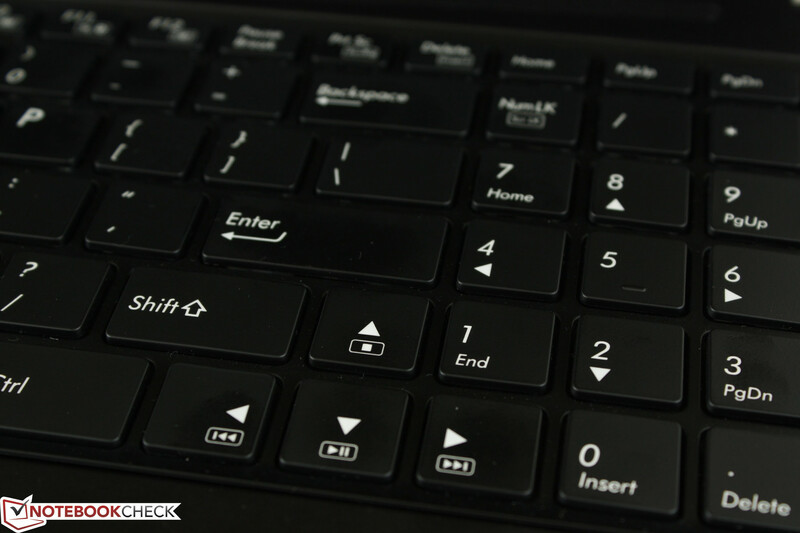 We especially like the location of these keys as they can be easily and quickly pressed with the left hand while on the WASD keys when gaming. This is in contrast to the Chimera CX-9, which has its macro keys out-of-reach and above the keyboard instead. The macro keys here are a bit smaller and softer compared to the main QWERTY keys, so there is certainly still room for improvement. 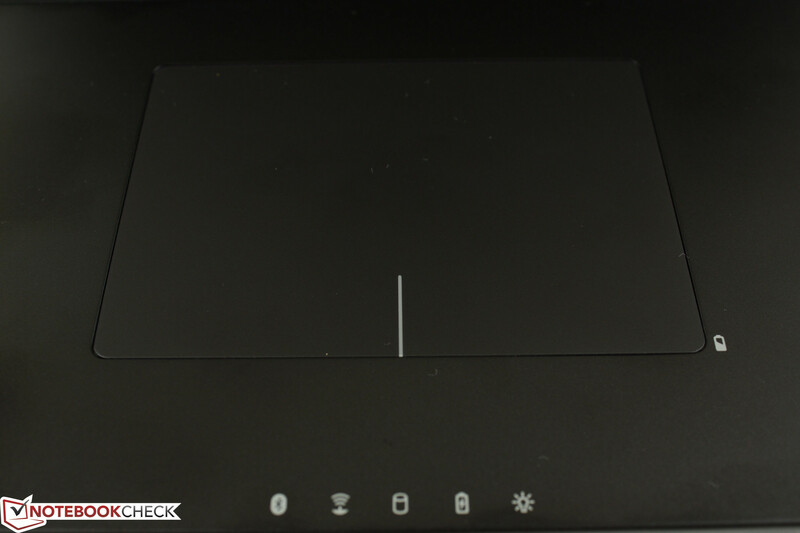 The touchpad is an adequate 10 x 7 cm, but the available surface area for cursor movement is actually less than it appears at about 10 x 5.5 cm because the bottom section of the touchpad is reserved for mouse clicks only. 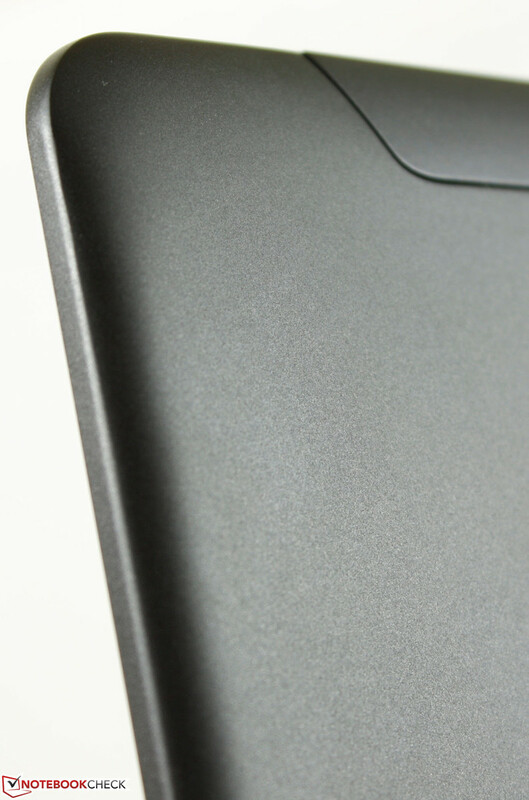 There is no texture or surface separation between the touchpad and mouse keys, so controlling the cursor can be a pain as it will frequently start and stop as you glide across the entirety of the touchpad surface. Responsiveness is fine otherwise, but some kind of separation between the tracking and non-tracking surfaces would aid in ergonomics. The mouse clicks themselves are uneven between the left and right click keys. The left click feels more satisfying with a more tactile and firm auditory response compared to the spongier right click. Both sides could definitely use more depth though, especially compared to the superior touchpads on the G751 and newer Clevo models. 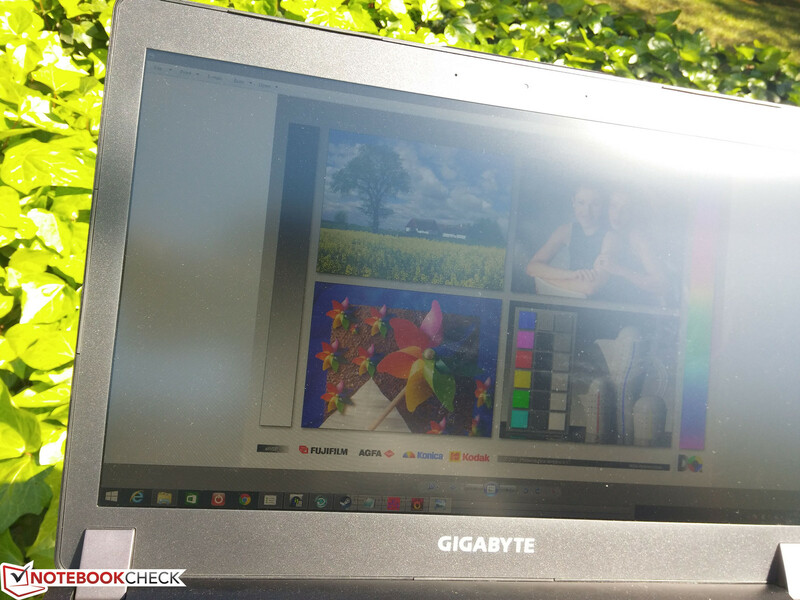 Unlike the recent 15.6-inch MSI GS60 models, Gigabyte is sticking with matte 1080p displays for the P37 series. The LG Philips LP173WF4-SPF1 panel used here can also be found on the Lenovo Y70 and Acer Aspire V17 and while it may not be as sharp as 2K or 3K+ panels, it avoids any scaling issues that commonly arise with higher native resolutions. 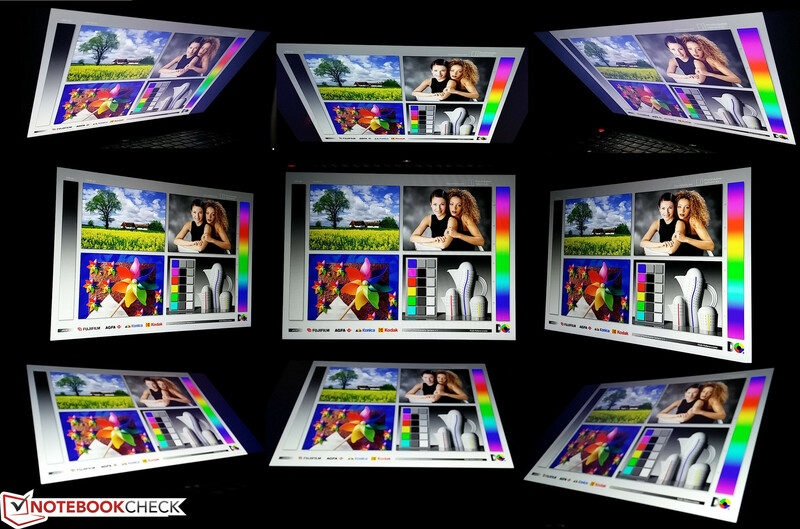 The screen is also remarkably devoid of any color noise, so pictures appear extremely clean with pure colors. 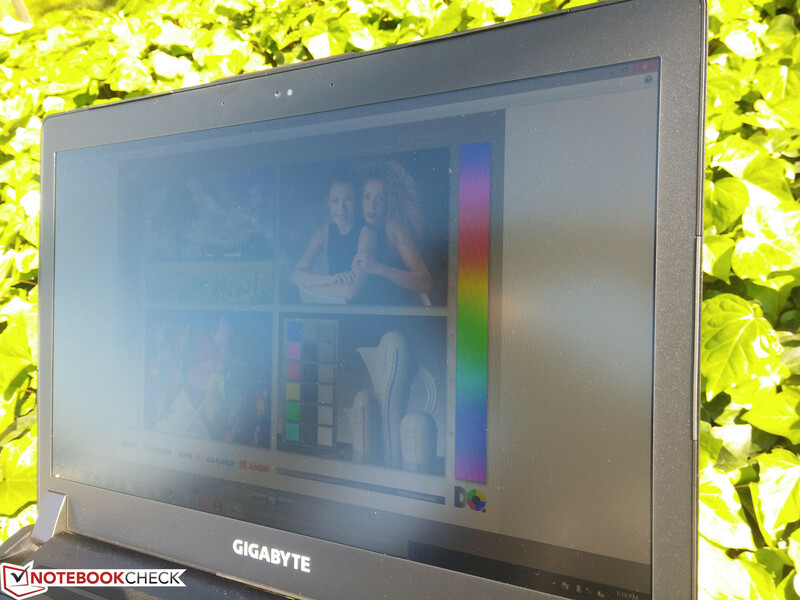 Display brightness is high for a gaming notebook at an average of about 350 nits. 250 nits (or higher for glossy displays) is usually enough for an indoor environment, but it's nice to have the option to go brighter if needed. Its contrast of about 500:1 is good for gaming and movies. 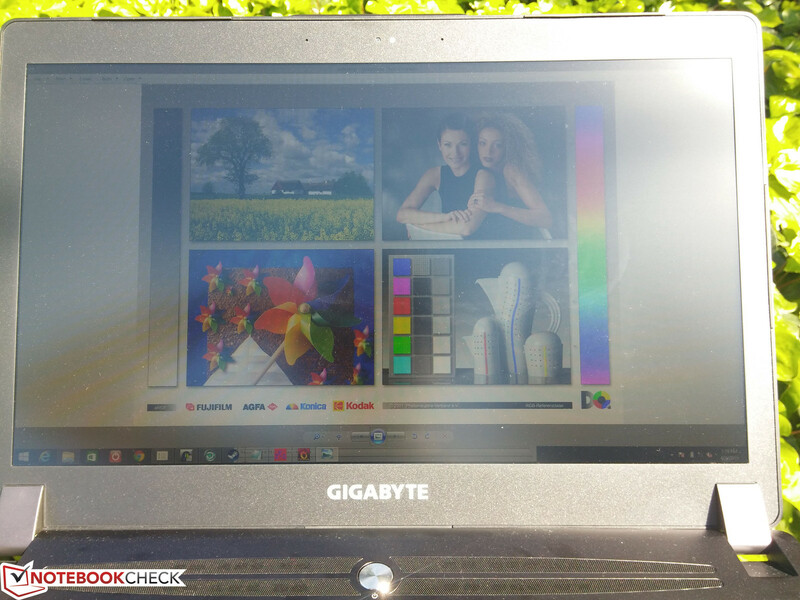 Competing notebooks, however, tend to offer higher contrast for even deeper black levels at the cost of lower maximum display brightness compared to the P37X. 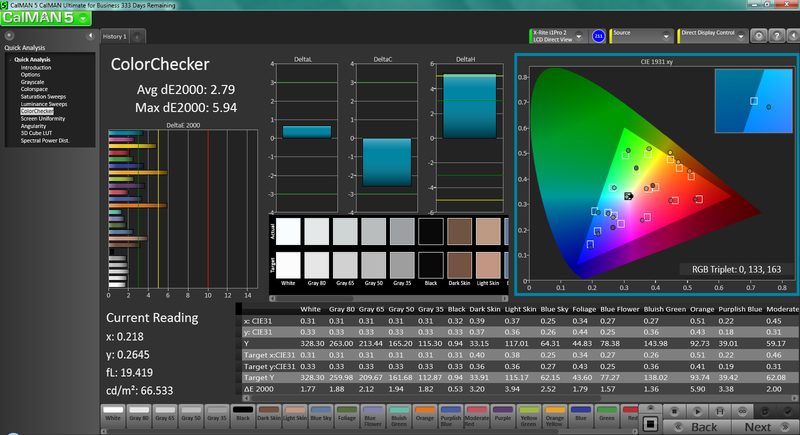 Color space reproduction is very good at 78 percent and 58 percent of sRGB and AdobeRGB, respectively. The coverage is a least 10 percent more than budget TN panels for both standards and is equivalent to expensive IPS panels aside from those found on professional mobile workstations like HP ZBooks or Dell Precision models. 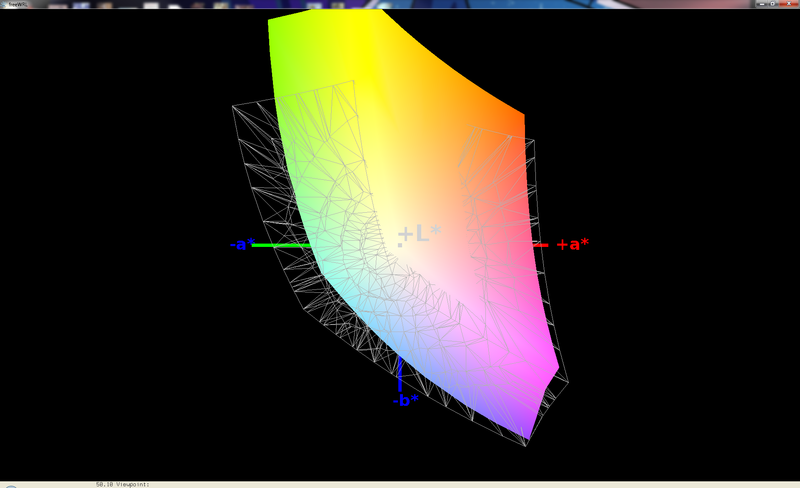 Colors are also about as wide as competing Asus G751 and Aorus X7 models at over 90 percent overlap. 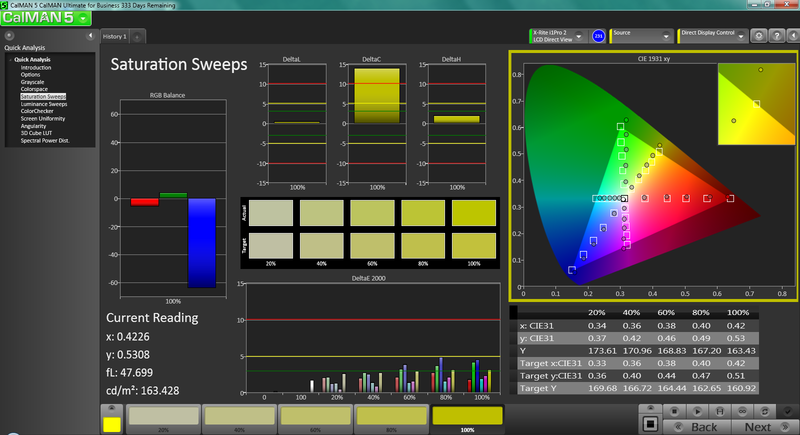 Further color analyses with an X-Rite spectrophotometer reveal accurate grayscale and colors out-of-the-box. 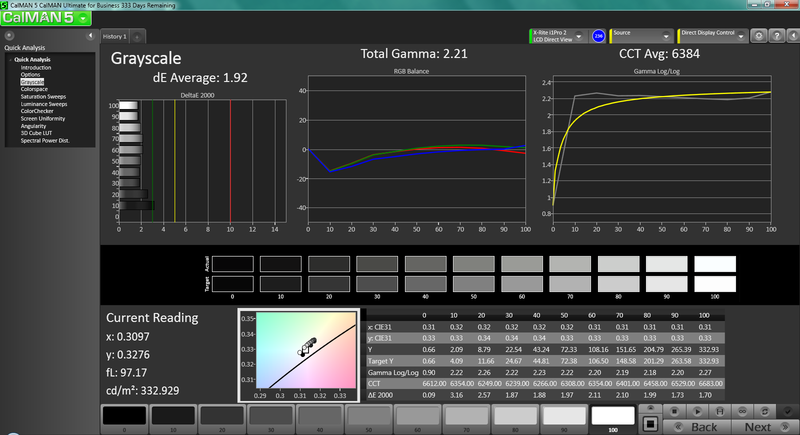 All colors have very low DeltaE deviations and are generally more accurate the lower the saturation level. Yellow and Orange colors are represented least accurately compared to the other colors, which is again similar to the Lenovo Y70. 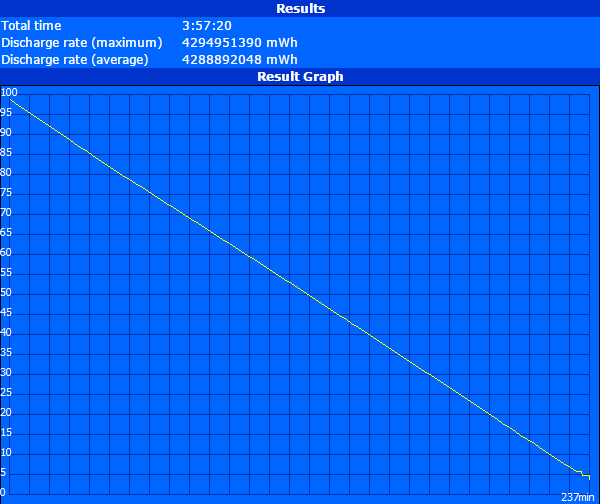 Calibration efforts resulted in very marginal improvements across the board. Outdoor visibility is better than expected due to the relatively high brightness, low DPI, and matte display to reduce reflections. However, such a large display requires an even brighter backlight than what is available, so users will still be limited to working under shade and away from direct sunlight. Additionally, no matter how thin a 17.3-inch notebook can be, it will always have a large footprint that will be difficult to comfortably handle outdoors for long periods of time. 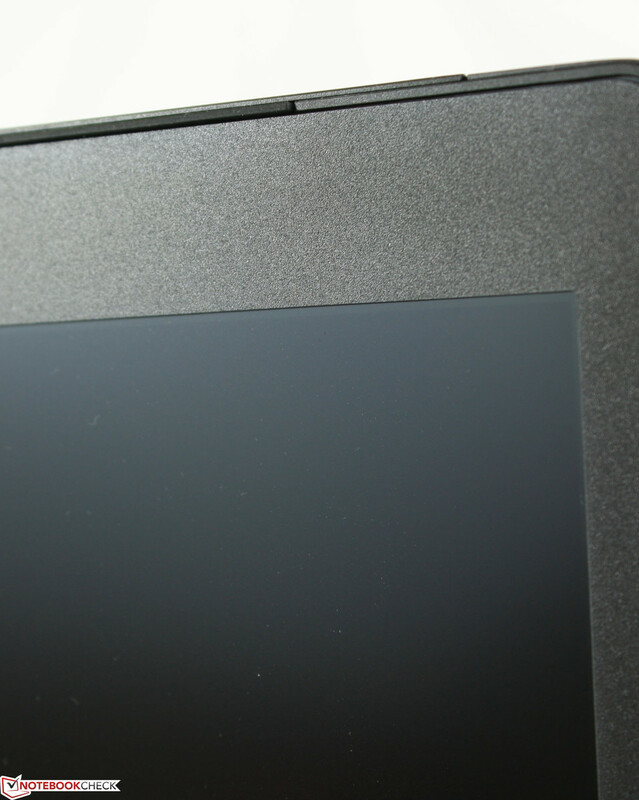 Viewing angles are excellent as expected from an IPS panel. The large 17.3-inch screen size makes it easy to share the notebook with others nearby with no major degradation in colors or grayscale. The P37X uses the same Core i7-4720HQ that is common amongst most high-end gaming notebooks. 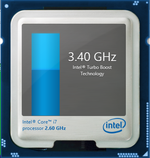 The Haswell CPU runs at the 800 to 1200 MHz range when on the Power Saver profile, but is otherwise capable of running up to 3.4 GHz or 3.6 GHz for multi-threaded and single-threaded operations, respectively. Similarly, the discrete GTX 980M will idle at 135/162 MHz core/memory and can run up to 1126/1252.2 MHz core/memory with GPU Boost. RAM is provided by two removable Transcend SODIMM modules for a total of 16 GB. The RAM and other internal components are easy to access as the maintenance panel underneath pops off without much of a hassle. 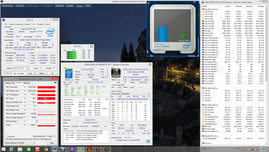 The Core i7-4720HQ performs well in synthetic benchmarks with no artificial throttling implemented. 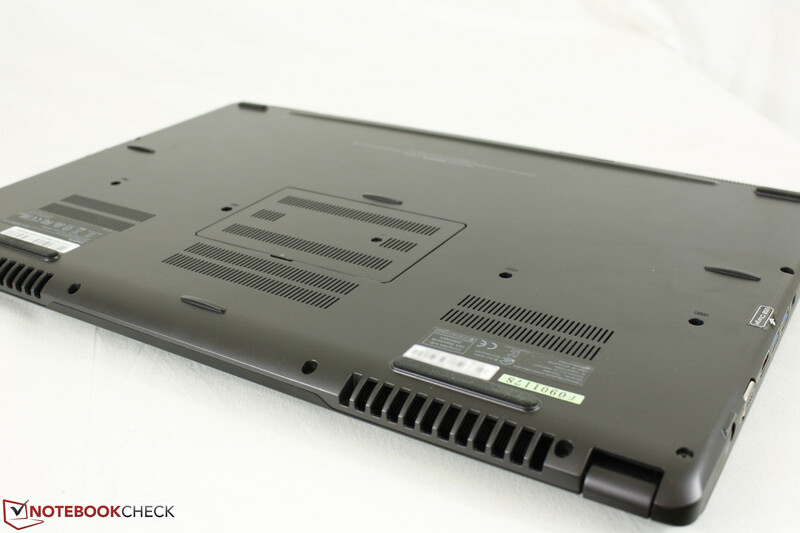 Results are similar to the P34W v3, which uses the same CPU in a smaller 14-inch chassis. Multi-core performance is slightly better than the popular desktop i7-2600K and about 10 to 15 percent slower than the current i7-4940MX champion according to CineBench R15. Single-threaded performance according to Super Pi is also again very similar to the i7-2600K despite running at half the TDP (47 W vs. 95 W) and at much lower base frequencies. 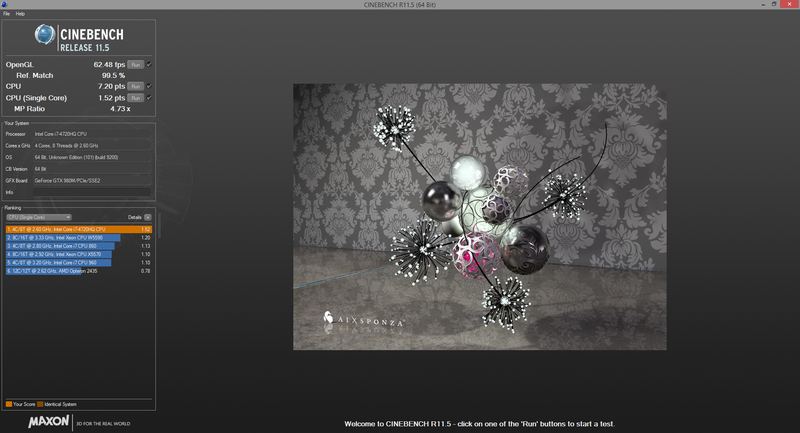 Compared to the Ivy Bridge generation, the CPU is most similar in performance to the i7-3840QM. 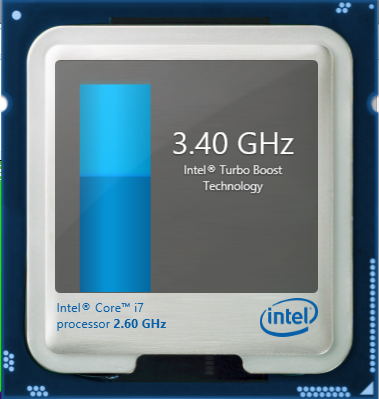 More technical information and benchmarks on the i7-4720HQ can be found on our dedicated CPU page here. Synthetic system performance benchmarks place the P37X alongside other high-end gaming notebooks like the P25X v2 and MSI GE62. 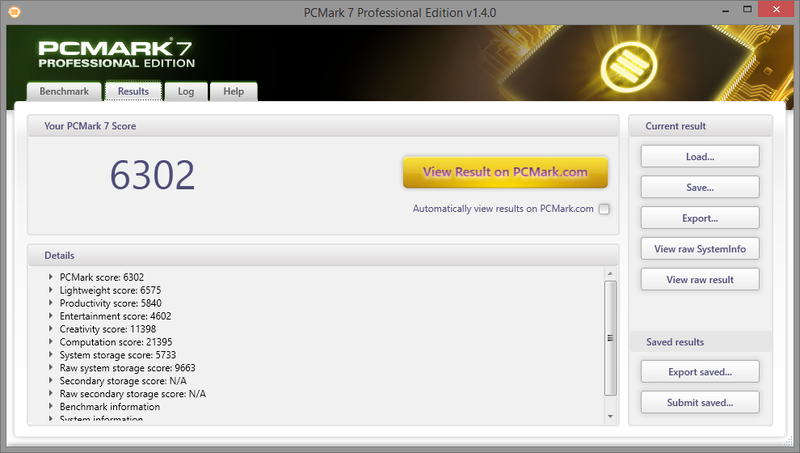 Its PCMark 7 score could have been a little higher as it just barely edges out the iBuyPower Chimera CX-9 (6302 vs. 6290) despite the latter having a much weaker GTX 860M GPU. 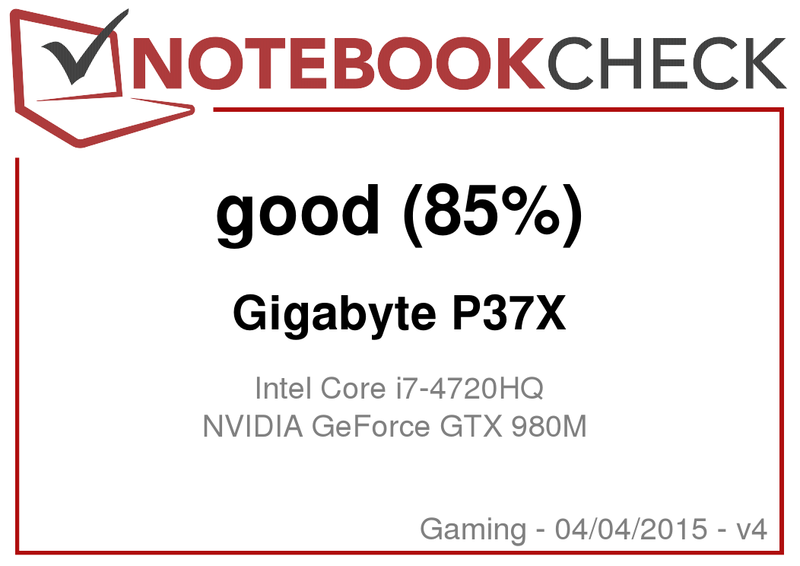 RAID 0 performance, which greatly affects final PCMark scores, is relatively slower on the P37X and prevents the notebook from reaching higher numbers on paper. Subjectively, the operating system and applications respond instantaneously with no major latency issues similar to other SSD-based notebooks. Multi-tasking is incredibly smooth for both games and everyday browsing. 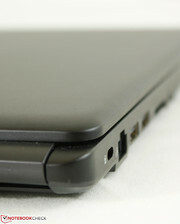 2x mSATA and 1x 2.5-inch SATA III slots are available on the P37. An additional SATA slot is occupied by a swappable optical drive that can be replaced with another HDD or SDD. This is similar to certain Clevo models, but is an uncommon feature outside of barebones. Note that this fourth SATA slot is not SATA III, so this extra storage drive will be slower than the two dedicated mSATA drives and the single SATA III drive. 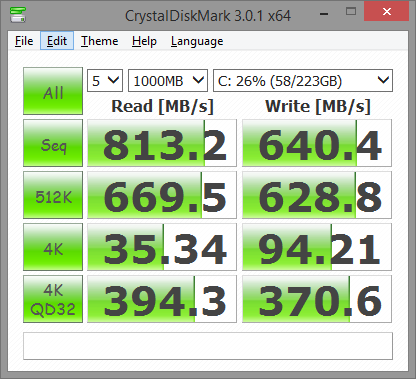 RAID 0 is compatible between all drives except for this slower SATA slot. Our test model uses dual 128 GB Lite-On LMT-128L9M mSATA drives in RAID 0 configuration and a single 1 TB Hitachi HTS721010A9E630 HDD. 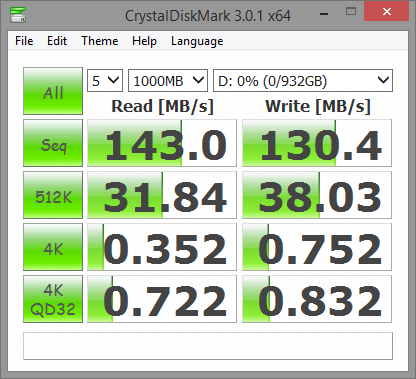 The mSATA drives are of course very fast, though raw write speeds are on the slower side for a RAID 0 setup according to CDM and AS SSD. The 2x RAID 0 Plextor drives in the Chimera CX-9, for example, returns sequential write speeds of 830 MB/s compared to just 640 MB/s on the P37. 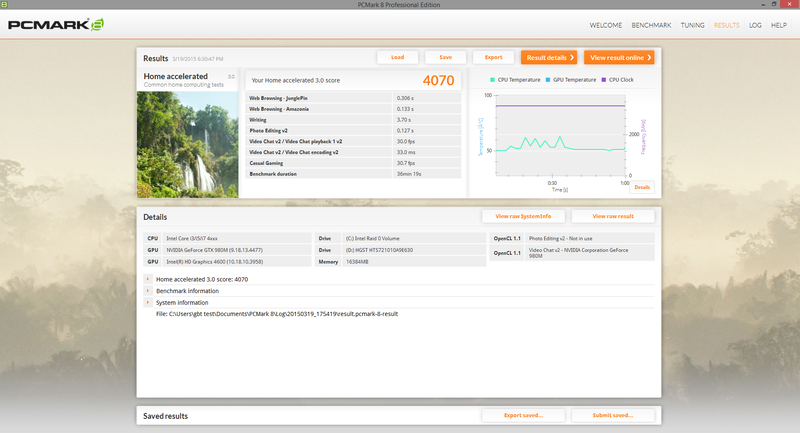 Meanwhile, the Hitachi HDD performs very well (as usual for hard drives from Hitachi) with a transfer rate of just over 111 MB/s according to HD Tune. 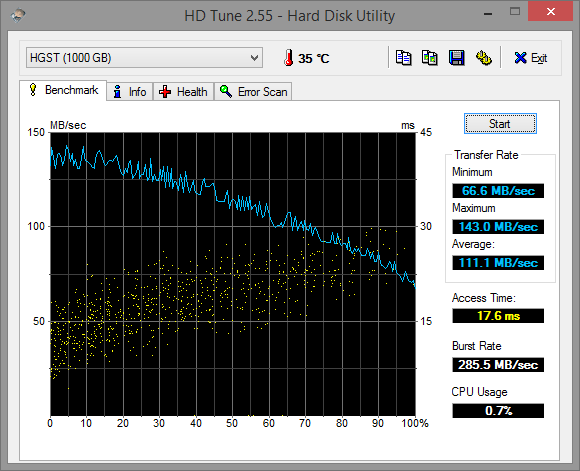 Typical drives normally fall in the 90 MB/s range or even lower for slower 5400 RPM platters. 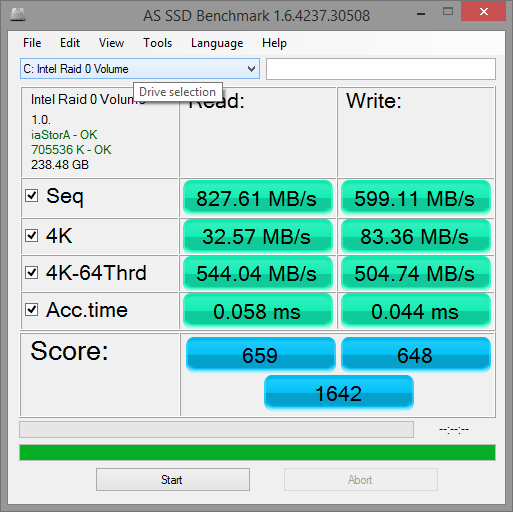 More HDD and SSD benchmarks can be found on our dedicated comparison table here. Synthetic graphics benchmarks place the P37 alongside the similarly equipped Asus G751 with healthy performance gains over the GTX 970M and the previous generation GTX 880M. Perhaps notably, 3DMark 11 results are close to the Eurocom X7 and its AMD Radeon HD 8970M CrossFire graphics while demanding far less power. Performance in games from the GTX 980M is pretty much second to none in the mobile field without resorting to SLI solutions. 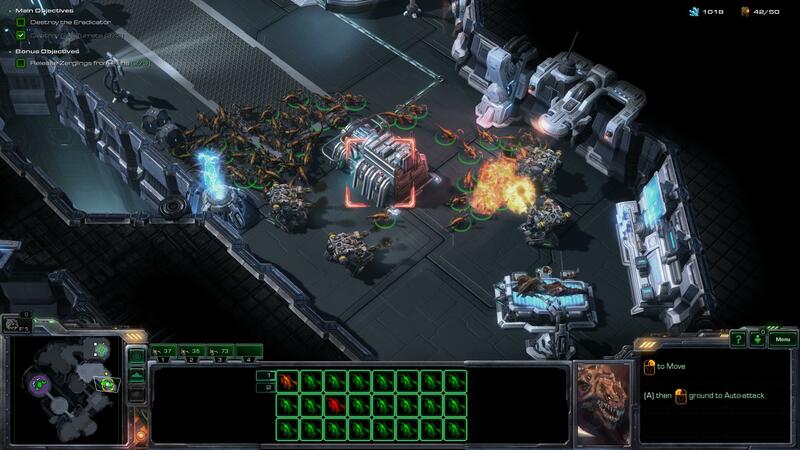 All tested games can be played on maximum settings at 1080p with average frame rates close to or above 60 per second. There are a few exceptions and we recommend checking out our dedicated GTX 980M page here for more comparisons and benchmarks. 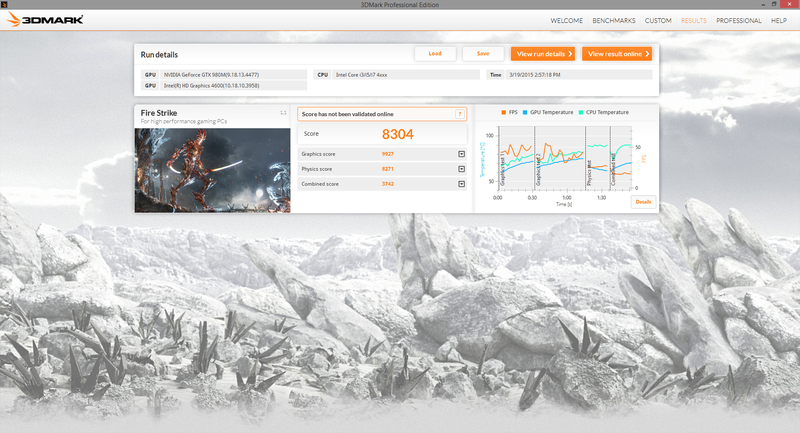 Results are in line with other notebooks carrying the same GPU with no outliers or stability issues unique to the system. 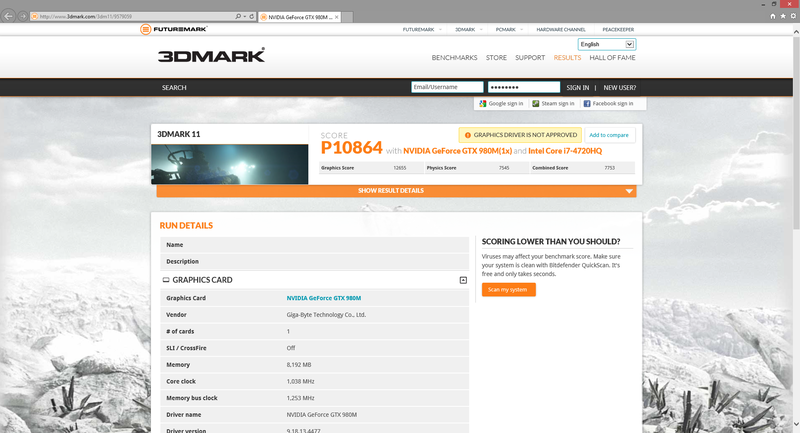 Frame rates are roughly 20 to 25 percent higher than the P34W v3 and its single GTX 970M. The Aorus X7 Pro and its GTX 970M SLI can run games up to 30 to 50 percent faster or even higher in the case of Thief, so anyone not satisfied with a single GTX 980M can certainly look into dual GPU solutions. 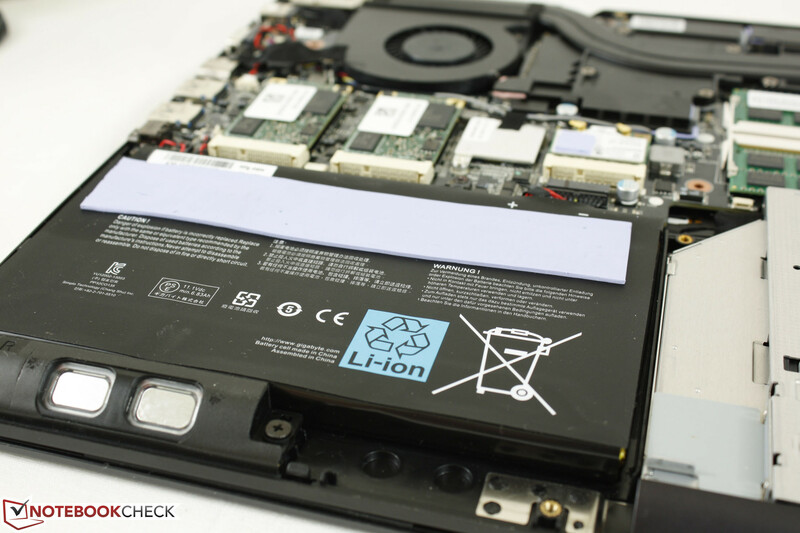 We stress the notebook with synthetic benchmarks to observe for any stability or throttling issues. First, with just Prime95 active, the i7-4720HQ CPU is able to maintain a steady 3.0 to 3.2 GHz clock rate or 400 to 600 MHz above the base clock rate. Core temperatures are maintained in the 80 to 90 C range. 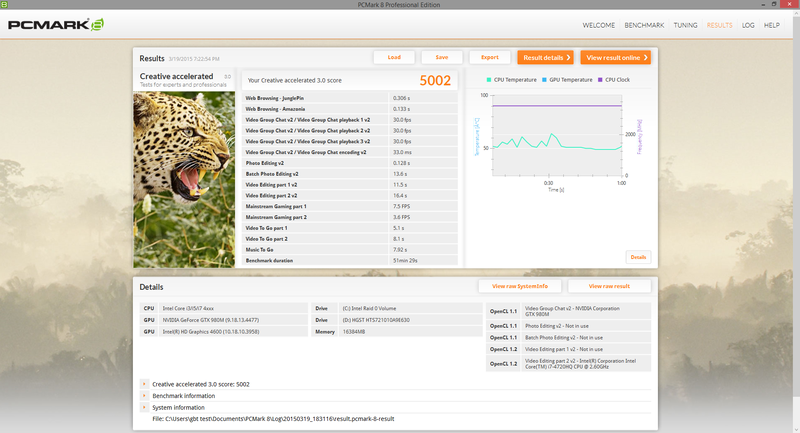 Next, with just FurMark active, the GPU drops to 848 to 873.3 MHz with temperatures reaching a maximum of 80 to 82 C according to GPU-Z. 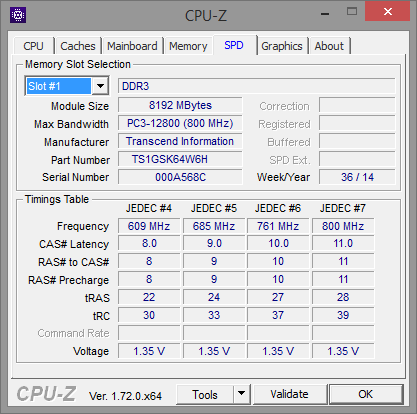 This is below the base clock rate of 1038 MHz for the GTX 980M, though memory remains consistent at the maximum 1252 MHz. 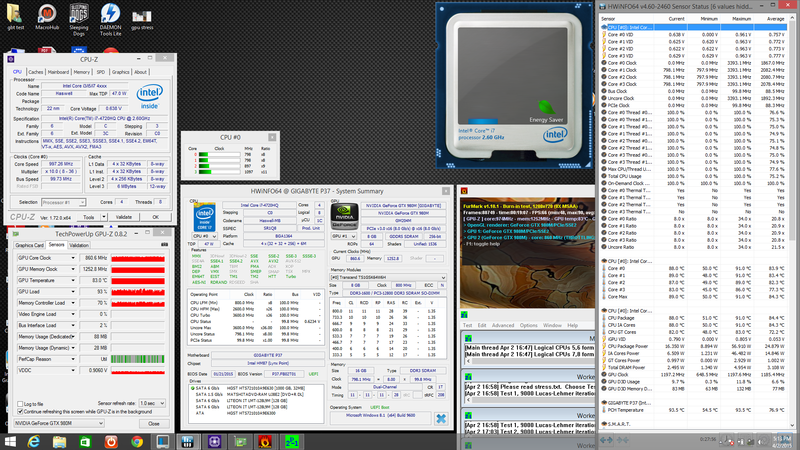 Full stress with both Prime95 and FurMark active will throttle both the CPU and GPU. 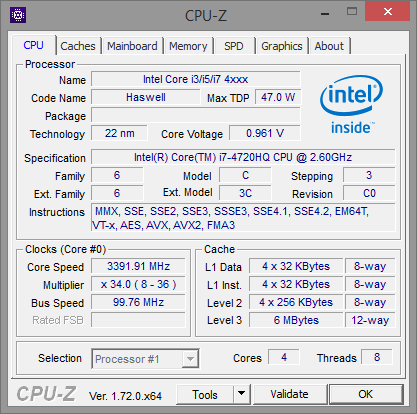 Under these conditions, the CPU will settle in the 800 to 1300 MHz range while the GPU will run in the 873 to 974.5 MHz range. CPU and GPU temperatures never go above 90 C and 83 C, respectively. 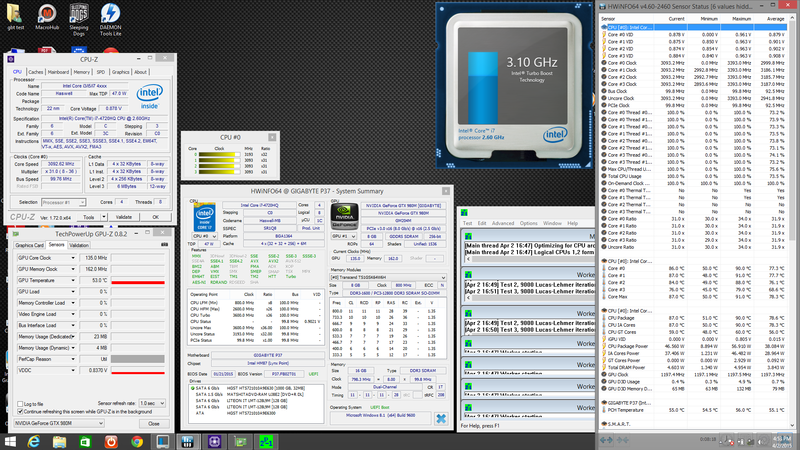 When taking into consideration the base 2.6 GHz speed of the CPU, the throttling here is extreme. 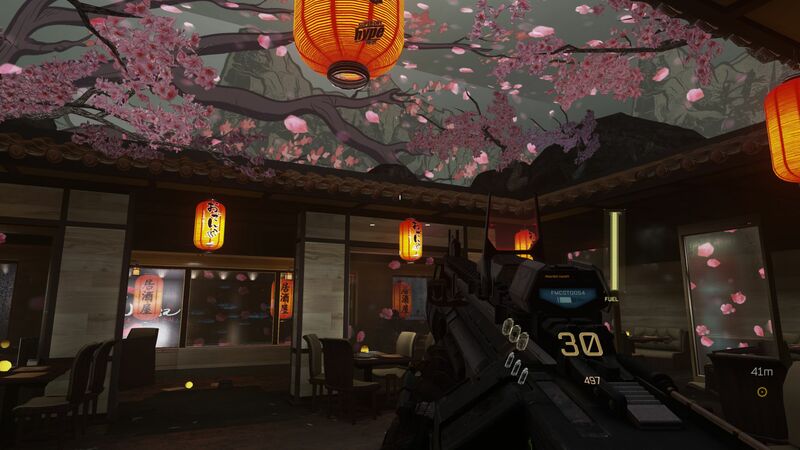 We run a more realistic stress test with Unigine Heaven 4.0 to better emulate gaming stress. 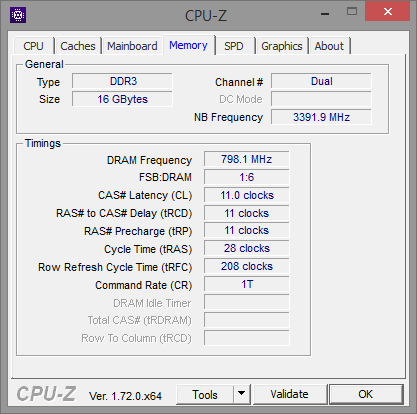 Under these conditions, the CPU is able to maintain a clock rate of about 3 to 3.4 GHz for the first few minutes before falling to the 2 GHz range. Turbo Boost benefits then become sporadic thereafter. 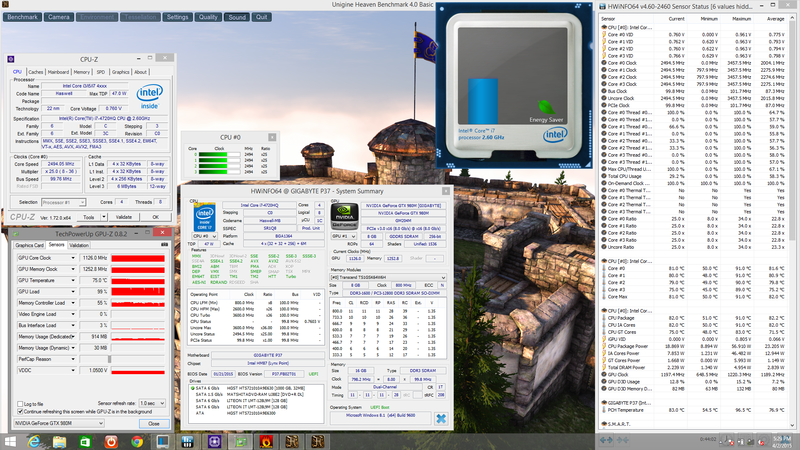 On the other hand, the GPU performs extremely well and will run at 1126/1252 MHz core/memory without ever dropping. 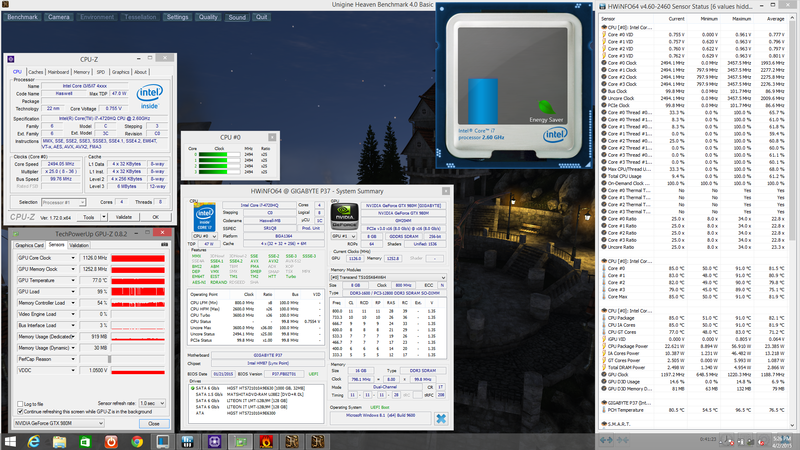 CPU and GPU temperatures peak at about 90 C and 77 C, respectively. The Turbo Fan feature will only drop core temperatures by a couple of degrees further. 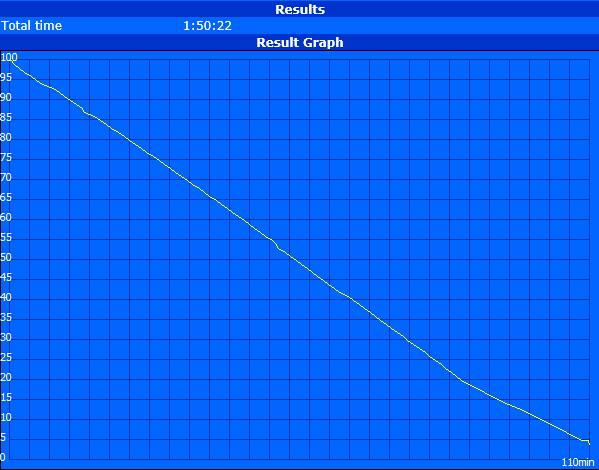 Gaming performance decreases very slightly overtime. By running the Metro 2033: Last Light benchmark ten times in a row, average frame rates can be observed falling from 63 FPS on the first run to 61 on the second and 59 on the third before leveling off at 58 FPS on the final run. Running on battery power will severely limit gaming performance. 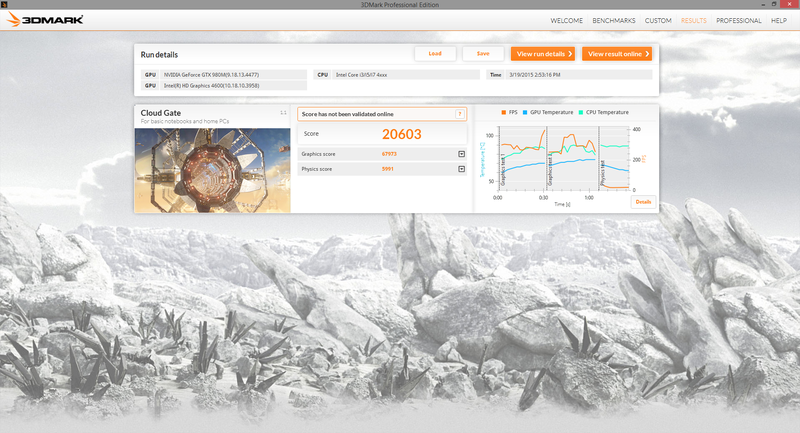 A quick 3DMark 11 run on batteries returned a Physics and GPU score of 6811 and 6540 points, respectively, compared to 7545 and 12655 points when on mains. 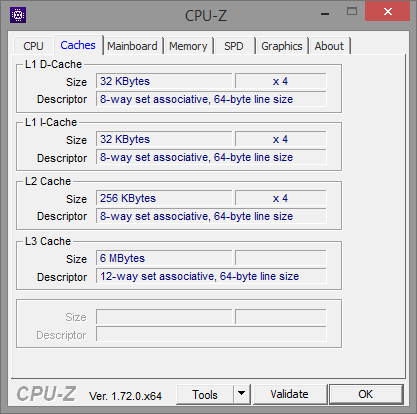 The CPU and GPU are throttled accordingly to as low as 800 MHz and 670.8 MHz, respectively. 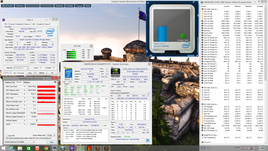 VRAM takes a hit as well to 799.2 MHz. 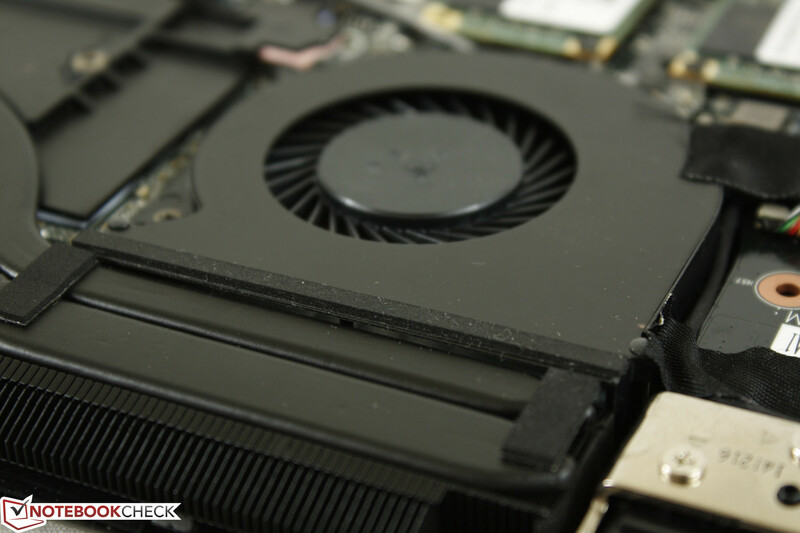 Two identical 50 mm fans connected via two long heat pipes make up the cooling solution for the P37. The fans are smaller than those found on the GT72 and Asus G751 due to the more limited space available. Both fans never idle even if the notebook is at its most energy-efficient state. 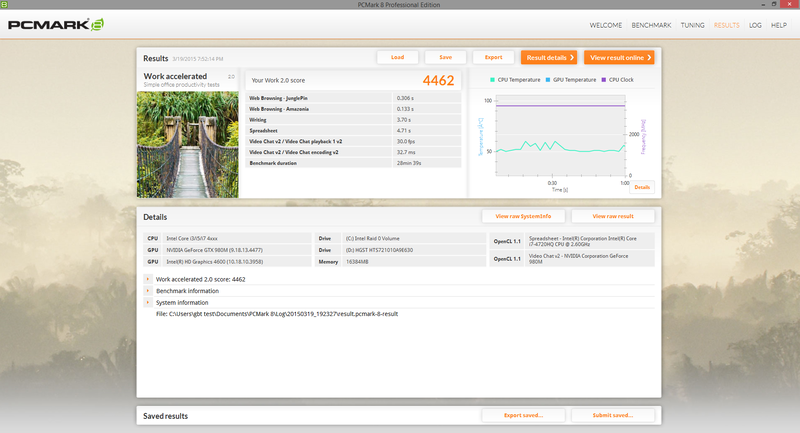 They are reasonably quiet at the lowest Stealth state at about 36 dB(A) when browsing or during video playback. Running on High Performance with the Nvidia GPU active can bump fan speeds to the 38 to 40 dB(A) range regardless of onscreen activity. Gaming will increase noise even further to the 47 to 51 dB(A) range. 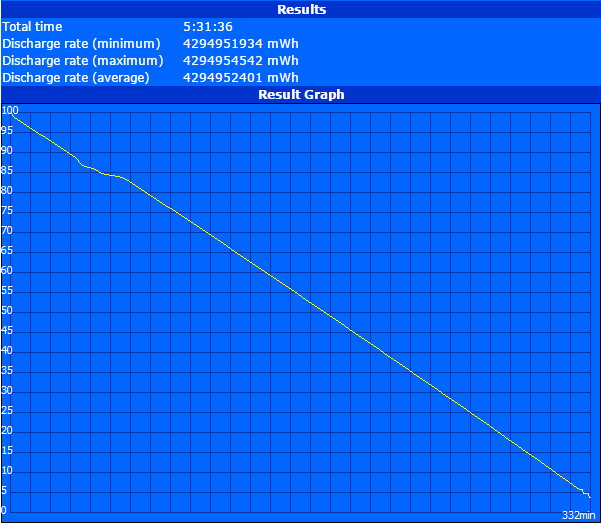 Max Fan mode results in a constant 54 dB(A). Compared to the GS70, system noise when gaming is similar at the low 50 dB(A) range. Thicker notebooks tend to settle in the mid to high 40s, which is still quite loud, so headphones will definitely help during gameplay. Surface temperatures are very warm even when sitting completely idle on the Power Saver profile with integrated graphics active. We were able to record temperatures of over 45 C on the rear of the notebook, which is much warmer than we had anticipated. In comparison, the MSI GT72 stays well below 30 C across all quadrants while the thinner MSI GS70 reaches 40 C under the same conditions. 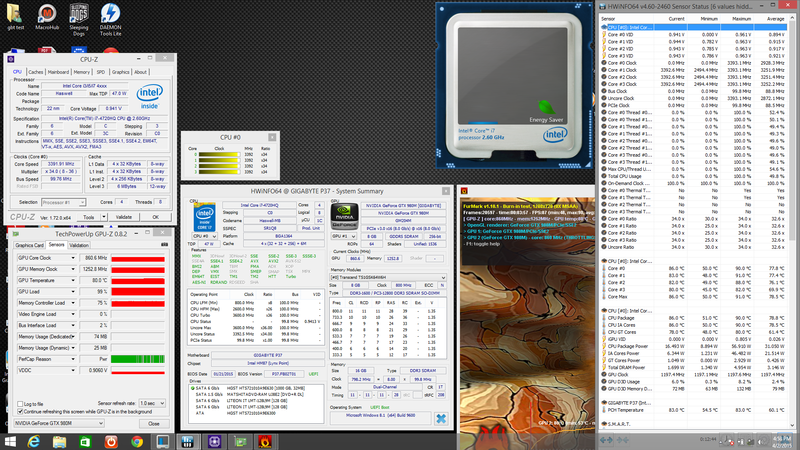 Maximum load (Prime95 and FurMark) for half an hour produces surface temperatures of over 65 C on the rear of the notebook directly above the CPU and GPU. This is significantly warmer than thicker gaming notebooks where they tend to stay below 50 C under the same conditions. The GS70 makes for a more appropriate comparison and the P37X does come out cooler in this regard. 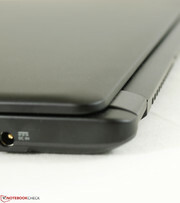 The front palm rests and the left side of the keyboard, for example, remain cooler on the Gigabyte than the MSI. Thus, the WASD and macro keys will be more comfortable to use when gaming. Note that the maximum load conditions above are more stressful than gaming conditions, so our temperature measurements are on the worst conditions possible. Users can expect the notebook to be a bit cooler during gameplay. (-) The average temperature for the upper side under maximal load is 38.7 °C / 102 F, compared to the average of 32.9 °C / 91 F for the devices in the class Gaming. The dual 1.5 Watt stereo speakers face toward the front edge of the notebook near the corners. Sound quality is very good even though the system lacks a dedicated subwoofer. Sounds feel balanced with no static or discrepancies at higher volume settings. We feel satisfied with the output for movies and music without resorting to external speakers, which is fortunate since the system lacks dedicated SPDIF and Line-in ports. The included Dolby Digital Plus software is easy to use but with less features than the Sound Blaster X-Fi MB3 solution. 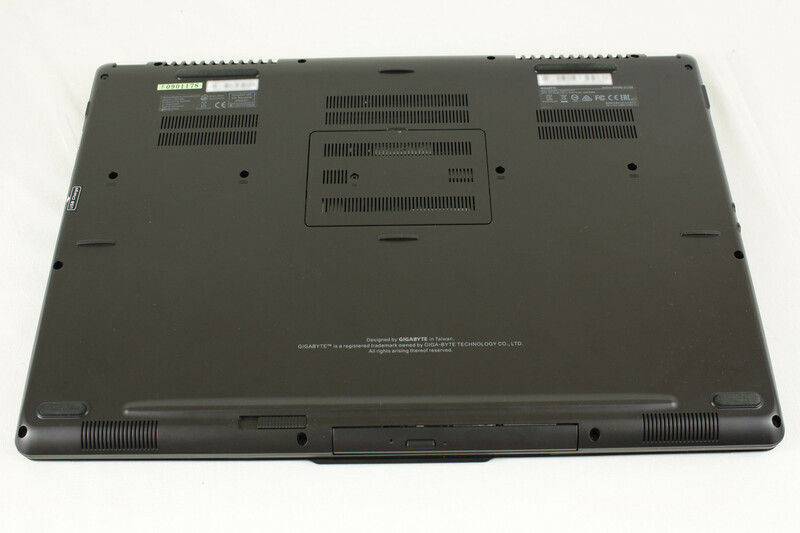 The non-removable 75.81 Wh Li-Ion polymer battery is an adequate size for a 17.3-inch notebook and is equal in capacity to the smaller 15.6-inch Gigabyte P35X. Less powerful gaming models have smaller modules such as the Acer Aspire V17 Nitro (52.5 Wh) and Lenovo Y70 (54 Wh) while thicker competitors like the Asus G751 (88 Wh) and MSI GT72 (87 Wh) have higher capacities. Battery life is average at almost 4 hours of constant WLAN use at a brightness setting of about 150 nits. This is similar to the Y70 and G751 despite the differences in capacities. 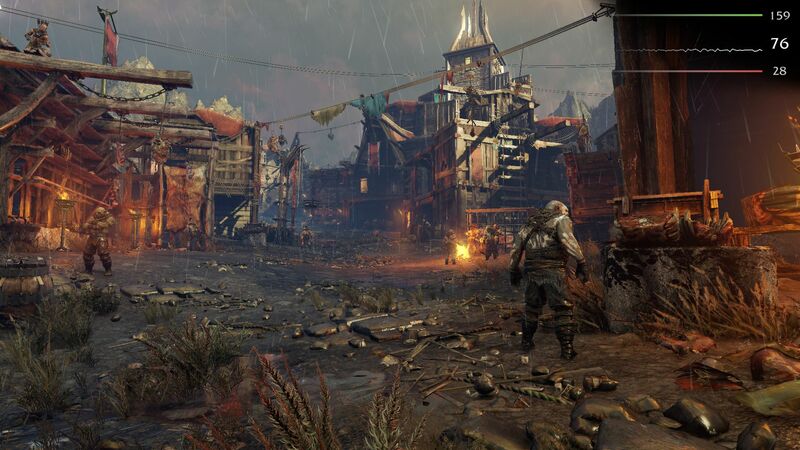 Users can expect half the runtime with intensive gaming and 5.5 hours of runtime under unrealistic minimum brightness and idling conditions. Gigabyte P37X. 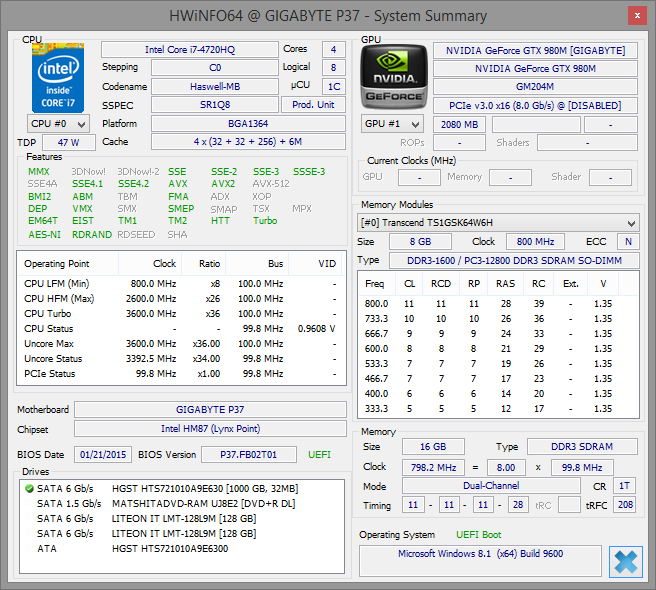 Test model provided by Gigabyte US. 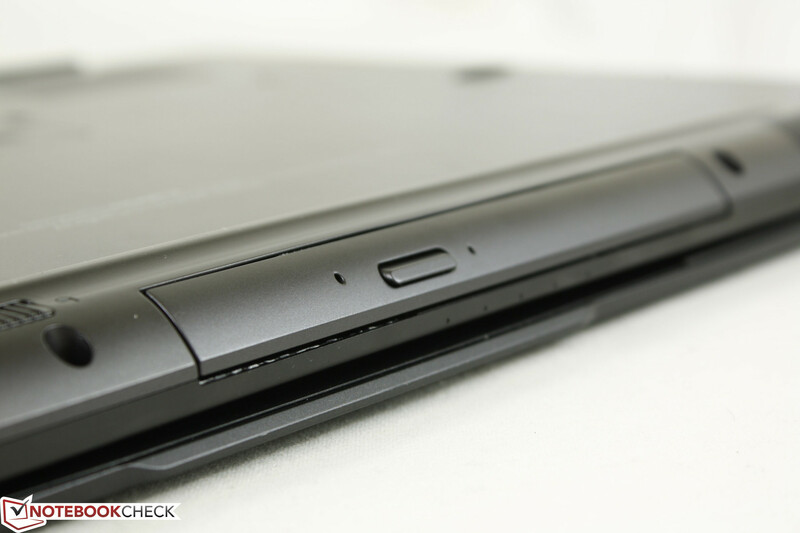 Why invest in a thicker gaming notebook when a much thinner and lighter one delivers roughly the same performance? 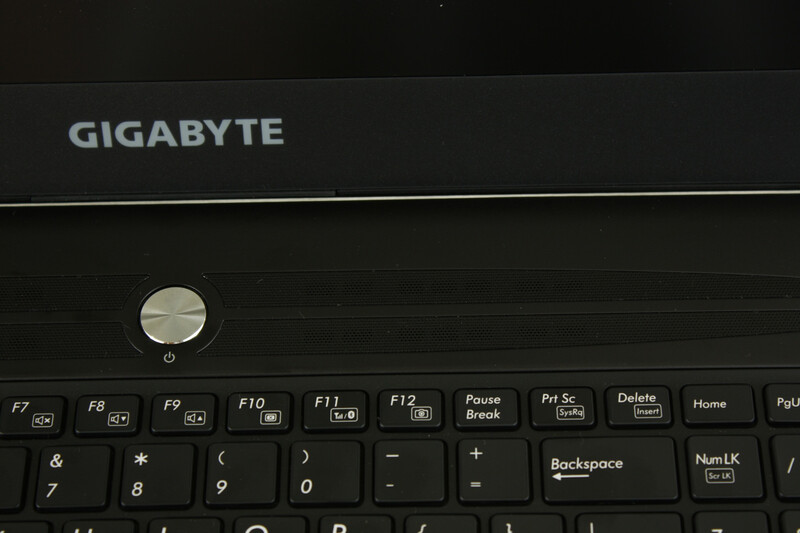 The Gigabyte P37X makes no significant sacrifices to hardware or quality for its slimmed-down profile. 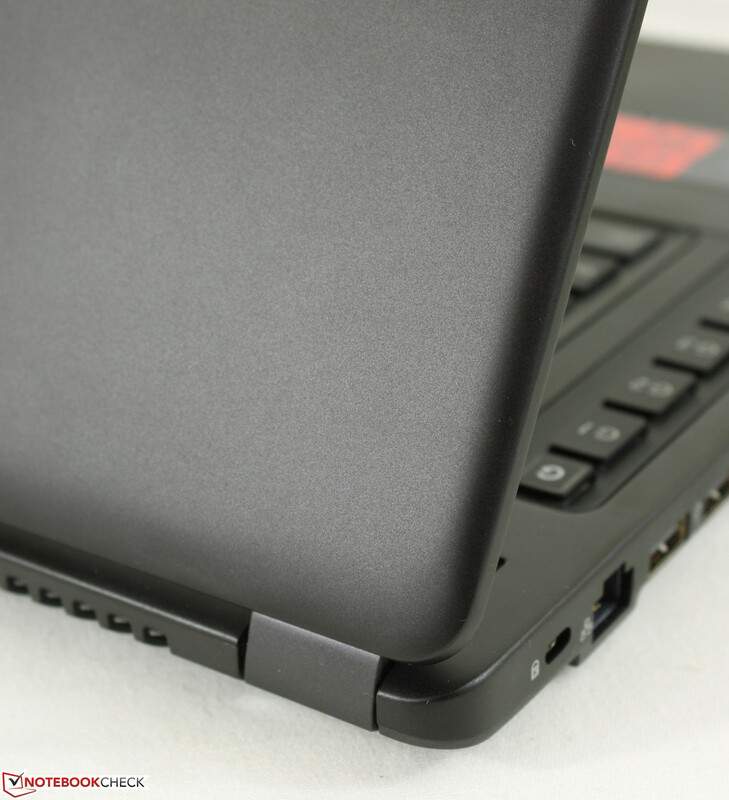 The aluminum base is solid with easy maintenance, the Chiclet keyboard feels comfortable, the matte IPS display is accurate out-of-the-box, and the 4x storage bays and 3x video-out ports provide wide expandability options expected from a high-end gaming notebook. 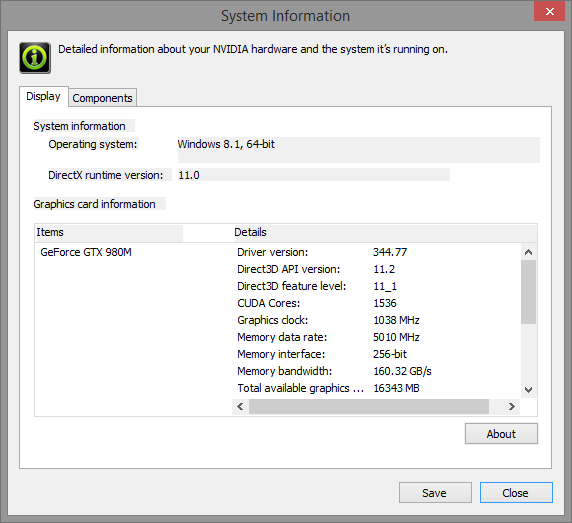 Perhaps surprisingly, the GTX 980M does not throttle under gaming loads and will run consistently at its its maximum 1126 MHz core clock despite the smaller cooling solution. CPU Turbo Boost is more inconsistent, but this shouldn't have a major effect on gaming performance. 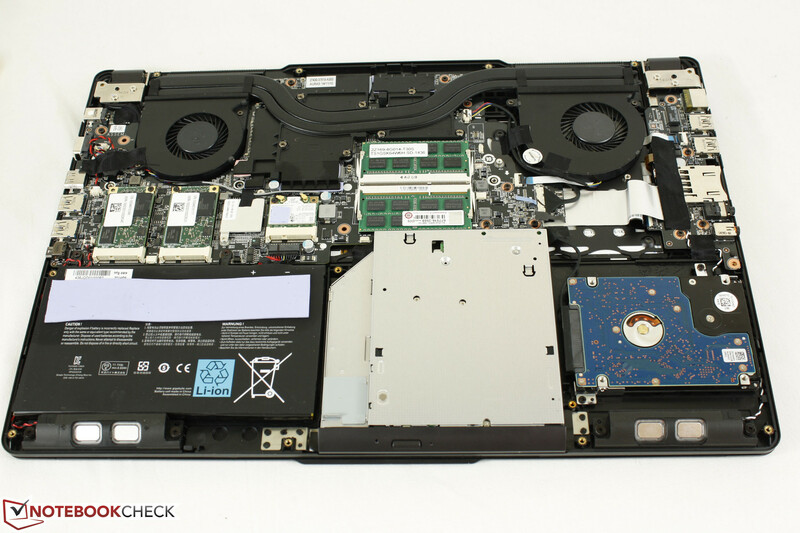 On the negative side, surface temperatures and fan noise are both higher than larger gaming notebooks. 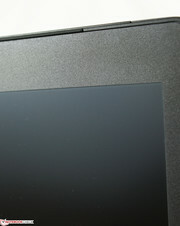 The display could have been more firm and the touchpad in particular could use a redesign. Visually, the chassis is bland and uninspiring, especially when compared to the Lenovo Y70 and the sleeker MSI Ghost and Aorus X7 series. The CPU and GPU are not upgradeable either (no MXM 3.0 slot), so upgradeability is a step down compared to barebone models. For $2000, the P37X starts on almost equal footing as competing models with 980M graphics. Ultimately, users will decide if they want a heavier, sturdier model that will be quieter and cooler or a thinner and more compact model that will run hotter and louder. 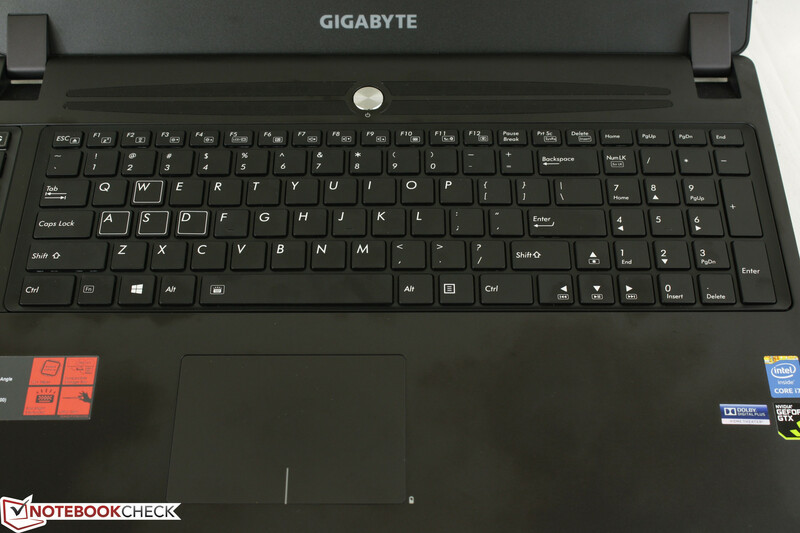 In Review: Gigabyte P37X. 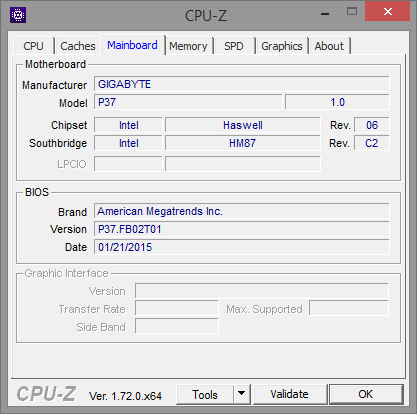 Test model provided by Gigabyte US.